I live in a cat house. No—not that kind of cathouse. The kind that is full of felines, as both my roommates have cats. Now I’m no cat expert, and it had been years since I’d had regular acquaintance with any. So I’m learning a bit more about cats in general as I get clued in to the particularities of each of these kitties. No newsflash for the pet owners among you—but it really is true how these critters have “personalities” of their own, and can amuse one for hours on end based on the character traits that make them uniquely them. Well, the other day, I was walking down the hall when I happened to look through the door into my roomie’s bedroom. There in the corner was Kaya, standing atop his perch looking into his own mirror. 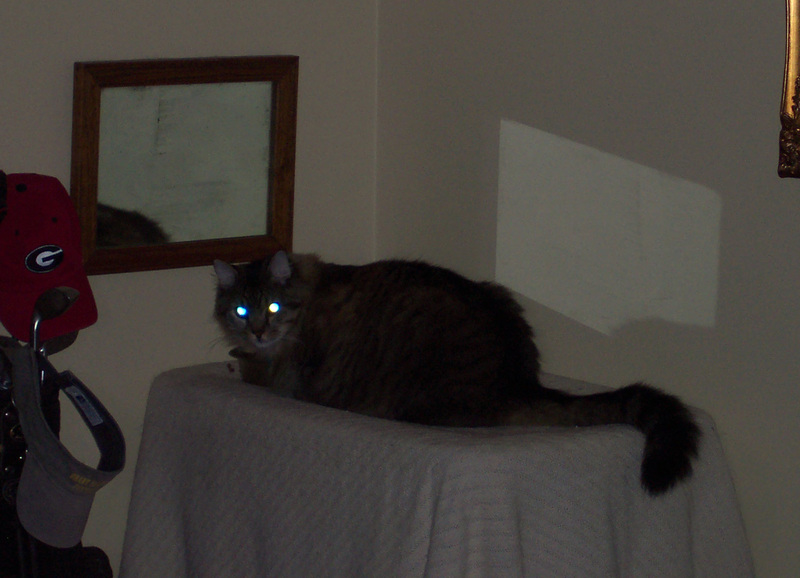 Now I’d never really stopped to think about it before that a cat would really need his own mirror. But seeing him there admiring himself for minutes on end, and then realizing the fact that along with his mirror Kaya’s food dish and water bowl happened to be elevated off the floor, drove home to me why. It would just not do for Kaya to eat off common ground! No sir! Kaya must have an exalted perch. It was further explained to me that Kaya will let his owner know when his water bowl needs to be changed—as he will flatly refuse anything near approaching day-old water—the point further made by his threatening demeanor for you to go do something about it. Like most firmly established but dysfunctionally-suspect relationships in the human realm, theirs is a pattern that has been established over time, with certain ritual moments even looked forward to with a sort of glee. 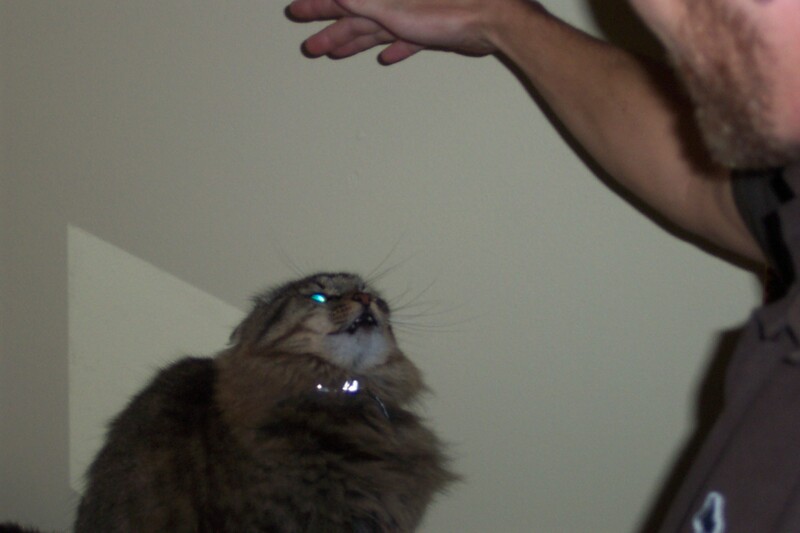 In telling me more about their history, my roommate starts to engage in a type of blood sport, where Kaya will often start whining, hissing, and flaring his fangs at any signs of affection such as attempts to pet him. His owner just laughs it off as he darts his hand in to pet him anyway then quickly retreats it, then eventually goes in for the kill as he swoops him up off his feet, rendering his claws immobile as he hugs him. No doubt this springs from kitty issues. They say you never really get to know someone until you know their story. One day Greg came home surprised to find the dominant male emu running around outside the pasture. 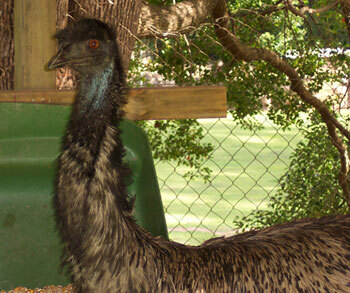 He had earlier reasoned his five foot fence should be high enough for the emus since it was tall enough for his horses. The moments that followed gave him pause to question the wisdom of owning emus. Greg’s wife told him to “Get that bird!” Greg grabbed the emu. The emu did not like being grabbed. My eyes got wide as saucers. “Then he shredded my drawers!” Our shock shifted to amusement. Now Greg is a big man, with big hands. He’s the kind of guy you’d expect to have some acquaintance with tools, a guy who’s seen his share of manual labor. In exasperation, Greg made for the quickest retreat he could. “I finally grabbed him and threw him back over the fence.” With adrenaline flowing and a hostile emu loose, tossing a 90 lb bird over a fence wasn’t a problem. Some time after he recovered from this incident, Greg came home to find the emu loose again. Bracing himself to face his old nemesis, Greg marched the warpath toward his truck where he could see the giant bird on the other side. This would not be the last run-in with this bird. Some time later, he disappeared altogether. Shortly after, footage was shown on the local news of Lake City police officers chasing an emu around town, trying to capture it. Thank you for sharing this great story, Greg! Happy New Year, y’all. I’m scribing this from my cold northern outpost of South Carolina—relative to FL anyway. But cold nonetheless, where it’s been dipping down into the 20s and 10s here. Brrrrhhh! Give me some balmy Floridian 40s! The singles event at the Museum of Art was very nice. My expectations were modest. I knew of only one friend ahead of time for sure, my college roomie, Michael. Funny how the little things feel like a lot when you’ve been out of the loop for so long—having long given up those expectations of seeing everyone you ever knew from your old life. I really didn’t know who would be there. It would be a mix of people across a span of years beyond my time here, where I might quickly get lost in an unknown crowd. Only when showing up at the door did this occur to me, and my old insecurities around strange social gatherings begin to flicker. A guy named “Event Coordinator” greeted me on my way inside. I presented my ticket, then zoomed by tables full of people enjoying dinner, by-and-large avoiding eye contact, choosing to direct my attention toward the buffet serving line. I needn’t have worried for anonymity’s sake, however. I soon heard a familiar voice from one of the tables: “Brian Bragdon.” It was Rachel… Whew. And so I began to connect with friends old and new, sitting with Rachel, and mingling with some of her friends there. To my left was a distinguished-looking African gentleman. I recognized his photo from a Christmas card off Michael’s refrigerator. Recalling what I thought was apparently his nickname, I blurted out, “Hey—You’re Fatty, aren’t you?”—so wanting to be in-the-socially-poised-know than the Gomer Pyle-ish rube I was quickly making myself out to be. Fatty (actually pronounced “Fah-tee,” and whom I learned was from Gambia) never corrected me. He just good-naturedly smiled as he welcomed the friend of friends—me only later catching my faux pas. I needn’t have worried. He was a gentleman, as I say. Everyone was dressed to kill. Excellent food, too—special nods to the prime rib and carrot cake. I slipped into a short spell of catch-up with Rachel, and was introduced to quite a few cute lady friends. Then got a Debbie alert from Michael. Going over to say hello to her and her mystery girlfriend, I got quite a shock when this friend called me by name and (re)introduced herself. Leslie Evans from TCA days. I had not seen her seen her since graduating, and would not have recognized her had she not said anything (after all, she was in junior high then). Saying small, small world somehow seems inadequate. But dang. Then there was Brian Helms—one of the friendliest faces on campus back then and once probably half my size he was so thin. Still friendly as ever—and bigger than me now, all filled out. He’s become something of a entrepreneur in Charlotte, managing several properties. I’d never have guessed this of Brian then. He’d come across Kiyosaki’s Rich Dad, Poor Dad in an English bookstore in Romania during his adventures abroad and started educating himself. He talked, too, of his former exp’s in Amway. Never got far with it but how he loved the positive attitude, personal growth, and camaraderie. I spoke of my own business venture this past year, and despite a similar story, we both agreed there was payoff beyond the outward experience of success or failure with any program. Out on the floor, a lot of dancing was getting underway. The DJ had a great selection of hits old and new—the more familiar the tune, the more I found my rhythm. I’d get inspired for a few seconds and my friends would be screaming, “Brian!” Meanwhile, it didn’t take long for my lower back to start joining in, too—“Brian!” Firing off dead lifts at 275 a couple days earlier was coming back to haunt me. But try explaining that to a mostly younger crowd. Better not let them see you wince! Not an easy thing when you’re supposed to be having fun. I did get that visit into the Ansel Adams gallery. Amazing. Many of his best known works on display. Getting the story behind the shots, as well as his thoughts on looking for the elusive perfect moment. There was a shot with this plain of boulders in the foreground with the giant Sierras rising behind. Actually taken from Manzanar, a Japanese internment camp in WWII. Adams was sensitive to themes of dislocation and loss rising out of the clashing issues of politics and race—feeling that while the harsh environment surrounding the camps echoed the residents’ suffering, it simultaneously offered an almost other-worldly comfort with beautiful views in the distance to help sustain their spirits. He tried capturing this juxtaposition of emotion on film with what he felt the experience of its residents might be. Find out more at http://www.hctc.commnet.edu/artmuseum/anseladams/details/mtwilliamson.html. I overheard this one gal in the gallery playing docent to a group of people. After her friends wandered off, we struck up conversation. Denise is living my dream life—she’s traveled all over the world as a photojournalist, and currently teaches some photography courses at USC. Where other people might see just pictures, Denise sees stories that need to be told. As if in echo to Adams, she told me about one assignment she did following a group of Somali refugees as they transitioned from their lives in an equatorial refugee camp to a suburban Chicago winter. Only a 48 hour trip, but worlds apart. The far longer journey was from one exile to another in search of hope, where terms like “culture shock” didn’t even begin to capture their experience. You can check out her work at http://denisemcgill.com/ . Back on the dance floor, Michael Bush was the star of the show. Maybe because he’s my good friend who’s never stopped cracking me up in over 20 years. And genuinely one of the coolest guys I know. But he did own it—all heads nodding their respect and clapping hands as he struck some pretty groovin’ moves while sporting some wacky strobe light shades. The DJ brought in midnight at the end of “1999.” He fudged a couple minutes to let the song play out, I think, but no one seemed to really notice. When he did the countdown, it suddenly occurred to me that hugs and kisses would soon be following amid the cheers. Standing next to me was a really attractive blonde, a friend of Rachel and Mandy I’d not met. In the spirit of the new year, I smooched her like we were well acquainted, introducing myself later to “Dena”… Hey—one of the few occasions I could get away with this. I wasn’t going to waste it. It has been a rather slow time overall on my vacation. The subtle seduction of inertia here compromises my ability to do daily disciplines well—like this writing, e.g. And prayer. All the more reason for short visits, though it’s been good visiting with my folks and grandmother… The other focus of my time—working on James’ chapter—which is still in progress. Hell and high water apparently were not enough to rush it through. Back on the road tomorrow. Will post next from O-Town.